Your worst nightmare begins with the awakening. This thrilling sci-fi horror board game doesn't just convince with a dense atmosphere and clever gameplay. Above all the detailed alien miniatures make this game something very special. And to keep the Xenos so impressive, here's the foam set for your Nemesis board game box. The set fits exactly into the original 'Nemesis' board game box by Awaken Realms. 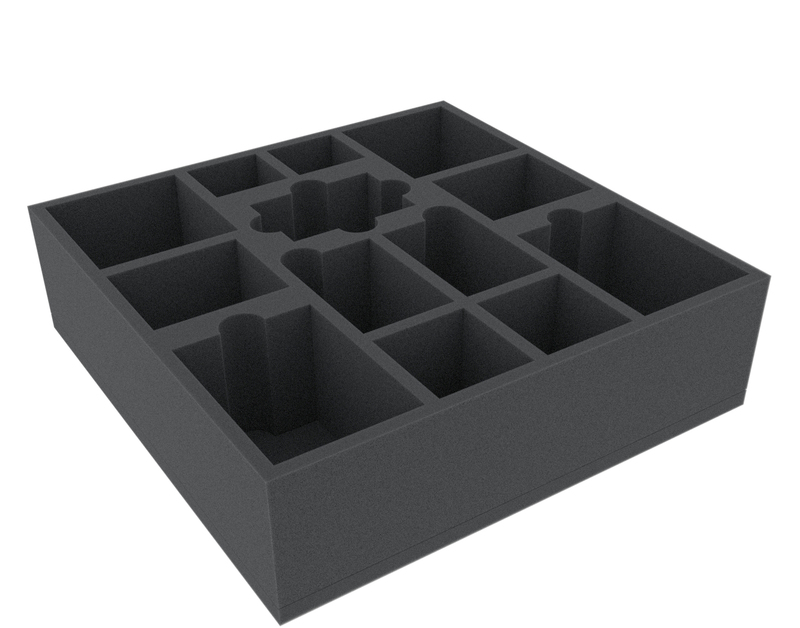 Provides space for all 26 miniatures and all accessories of the core game. Optional additional compartment for the Adrestia promo miniature. The lid of the board game box protrudes approx. 5 cm. The upper foam tray is of course reserved for the Queen. This Xenos model is assigned a large compartment, tailored exactly to the miniature. With this, the fine miniature stays safely in place even during transport. All other 21 compartments are also tailored precisely to the miniatures. Each figure is completely surrounded by foam. This means that even the roughest roads cannot harm the sensitive parts. If you paint your miniatures, you can also be sure that the colors are preserved from scratches and abrasion. The Captain and the other 5 character figures as well as the Larvae come into the twelve small square compartments. Three compartments house the Creepers and four rectangular compartments are for Adult Intruders. The oblong compartment serves as a shelf for the plastic card holders. One compartment with bevelled corners is left. Here you can either sort in tokens or use the box for storing the promo figure 'Adrestia' from the Lords of Hellas Kickstarter campaign. 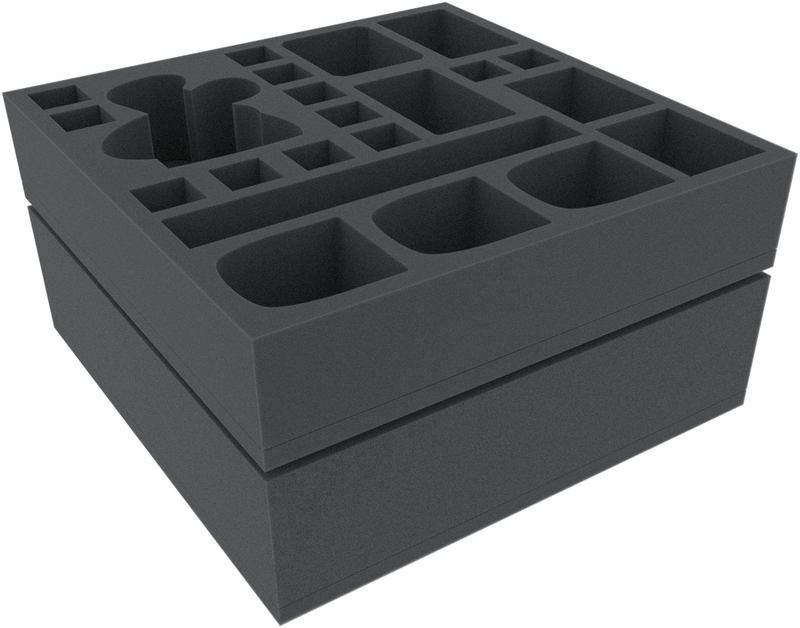 The lower foam insert has 6 compartments for the remaining miniatures - the Breeders and other Adults. It also has 7 compartments to help you stow the game material. There are a total of four card compartments, two for the small ones, such as the item cards, and two for the larger ones, like the objective cards. These compartments are provided with finger-wide recesses for easier removal of the stacks and are of course also suitable for cards with sleeves. You can sort the markers, tokens and dice into the remaining compartments. A suitable foam topper completes the all-round care of your 'Nemesis' box. On the cover you can put the larger cardboard parts such as the character boards, room tiles, the intruder board and the double-sided game board. Also the scanner, the intruder bag and the two booklets are placed here. Hereby, all miniatures are securely packed, the game material neatly stowed away and the contents of your box, even on the bumpiest paths to the next game, optimally protected.